TimeZone : Jaeger-LeCoultre » First Reverso! 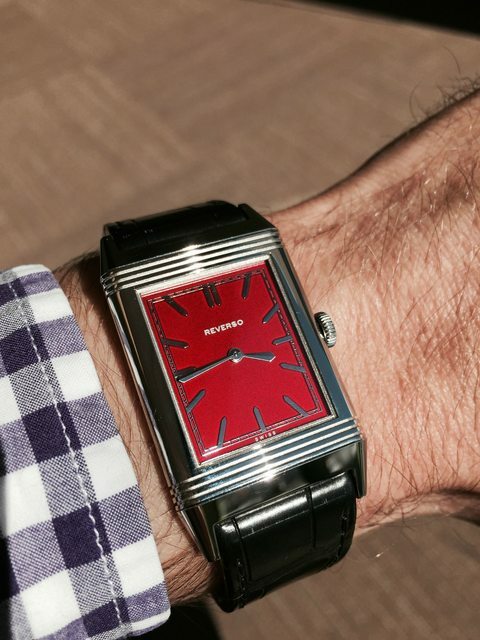 Toying with the idea of getting a Reverso since trying on a rose gold Grande Duo last year...happened to stumble upon this piece last Friday. My AD got it in and I thought it was too interesting to pass up. Hadn't planned on buying anything but with my 30th Birthday next week, figured I might as well make it count! The sun really makes this dial sparkle. Pretty happy with it!